Author: Trumble, Kelly Set In . . . The Library of Alexandria was the largest library of its time and a major center for learning and scholarly research, particularly in the fields of astronomy, geography, mathematics, and medicine. Caesar and Cleopatra, Erastosthenes and Euclid, Archimedes and Alexander the Great are just a few of the famous people connected to its story. Today, historians still argue about how the library was destroyed, and no one knows exactly what it looked like, yet there is no question that the library continues to fascinate and intrigue us. 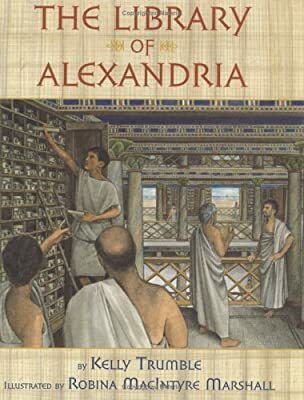 This extensively researched look at what we do know about the Library of Alexandria features Kelly Trumble’s short, accessible chapters, and richly detailed full-color paintings by Robina MacIntyre Marshall. Together, they tell the story of one of the wonders of the ancient world, and show how its influence as continued long after its destruction. Glossary, suggested reading, selected bibliography, index.